Could your posture use a boost? If you sit at a desk all day, the answer is likely yes. In this workout, you'll combine stretches and core exercises to improve your posture, range of motion, strength and flexibility — all in a single session! Follow along with @iamthedaisha for each exercise and its complementary stretch. Do them back-to-back for the recommended number of reps, performing three sets of both before moving onto the next pair. You won't need any equipment unless you want to use a mat for comfort. Try this routine up to five days a week for a stronger, more flexible body. Target your back, glutes and shoulders to improve your posture and range of motion with this Pilates exercise. HOW TO DO IT: Lie face down with your arms and legs opened into an "X" shape on the floor. Then, lift your chest, thighs and arms off floor. Your eyes should be gazing down and your neck in line with your spine. Lift your left arm and right leg slightly higher, and then quickly switch sides. That's one rep. Do 20 reps as quickly as possible, trying to keep your torso steady as your arms and legs flutter. Open up the whole front of your body, as those muscles can get tight from sitting at a desk all day. HOW TO DO IT: Lie face down with your knees bent and slightly wider than hip-width apart. Reach your arms back to grab your ankles. Then, lift your thighs and chest off the floor as high as possible. Try to bring your head in line with your heels. Hold for up to 30 seconds. Strengthen your obliques while also working your inner thighs and shoulders with this plank variation. HOW TO DO IT: Begin in a modified side plank with your left hand extended under your shoulder, your left knee bent on the floor, your right leg extended straight and the bottom of your foot pressed flat to the floor. Your hips should be stacked. Draw your abs in tight toward your spine and lift your left leg off the floor, bringing your left foot to the inside of your right knee — crossing your left knee slightly over the midline of your body. Hold for 10 seconds and repeat on the other side. Open up the hamstrings and hips with this relaxing stretch that can be done immediately after the balancing side plank pose. HOW TO DO IT: Sit with your left leg extended and your right knee bent and open to the side with the bottom of your right foot pressed against your left thigh. (Bring your right foot as close to your body as is comfortable.) Bend forward from your hips and reach toward your left foot, grabbing hold of your toes or shins. Hold for 30 seconds, and then repeat on the other side. This abs exercise doesn't look like much, but it's definitely a challenge for your core! 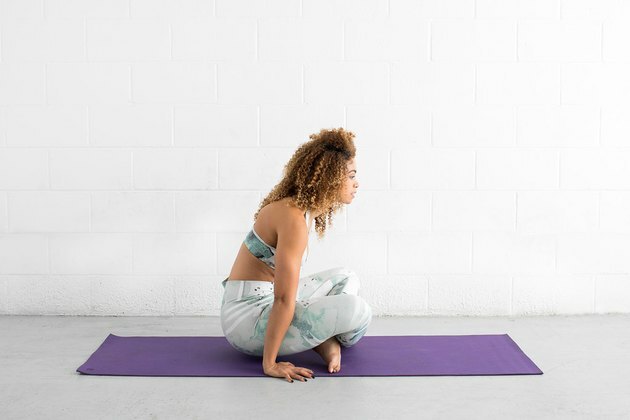 HOW TO DO IT: Begin by sitting cross-legged (or if you're able, in lotus pose) with your hands just outside your hips and pressed into floor. Tilt your pelvis up, and round your back. Scoop your abs in deep toward your spine while pushing down into the floor with your arms to lift your hips off the ground. Hover and hold for up to 30 seconds. For the next set, cross the opposite leg in front. If your hips don't come off the floor yet, work on the tilt and scoop. Relax your back and hips with this restful stretch — you'll need it after the seated hover move. HOW TO DO IT: Simply lower your hips to floor from the hover position and fold your body over your legs. Reach your arms out in front of your body — on the ground — to stretch your hips. Hold for up to 30 seconds. Engage your thighs and abs with this "Matrix"-inspired move. HOW TO DO IT: Begin kneeling with your legs about hip-width apart, your toes pointed behind you, and your arms extended out in front of your chest, palms facing down. Brace your abs and maintain a straight line from your knees to your head. Hinge back as far as possible. Return to starting position. Do 10 reps. Feel free to fold a mat or towel under your knees for extra cushioning, if needed. Stretch your chest, thighs, hips and back with this yoga pose. HOW TO DO IT: From the starting position of the kneeling hinge, press your hips forward, arch your back and reach your hands back toward your heels. To make this move easier, tuck your toes under to bring your heels closer to your hands. Hold for up to 30 seconds. Ready for this challenging move? It's tougher than it appears! HOW TO DO IT: Start on all fours, brace your abs, extend your right arm by your right ear and extend your left leg out behind your hip. Your leg and arm should make a straight line through your torso. Hold for one to five seconds. Trying not to shift through your body, lower your arm and leg and switch sides. Imagine trying to balance a cup of tea on your lower back during the entire exercise. Do 20 alternating reps.
Continue to work your core muscles and stretch your quadriceps, hip flexors and chest with this balancing stretch. HOW TO DO IT: From all fours, extend your opposite arm and leg. Bend your knee and try to grab ahold of your foot with your opposite hand. Pull your foot in toward your body and lift your leg as high as possible. Hold for up to 30 seconds. Repeat on the opposite side. Target your abs while engaging your entire body with this plank variation. HOW TO DO IT: Start in a full plank, with your feet together and your arms extended straight underneath your shoulders. Bend your right knee in toward your chest, scooping your abs in toward your spine and allowing your back to round slightly. Pulse your knee closer into your chest 10 times, drawing your abs in tighter as your knee pulls in. Repeat on the opposite side. Open up tight hips and inner thighs with this final stretch. HOW TO DO IT: Transition from your last set of knee pull planks by lowering your lifted leg to floor, turning your knee out to the side and bringing your heel forward. Slide your back leg down into the floor, pointing the foot behind you with the top of your foot resting on the floor. Lower your upper body to the floor, bend your elbows and rest your head on your hands. Too tough? Keep your upper body lifted with your hands on the floor for less intensity. Hold for up to 30 seconds. Repeat on the opposite side.